Finally an eco-friendly paper trimmer! 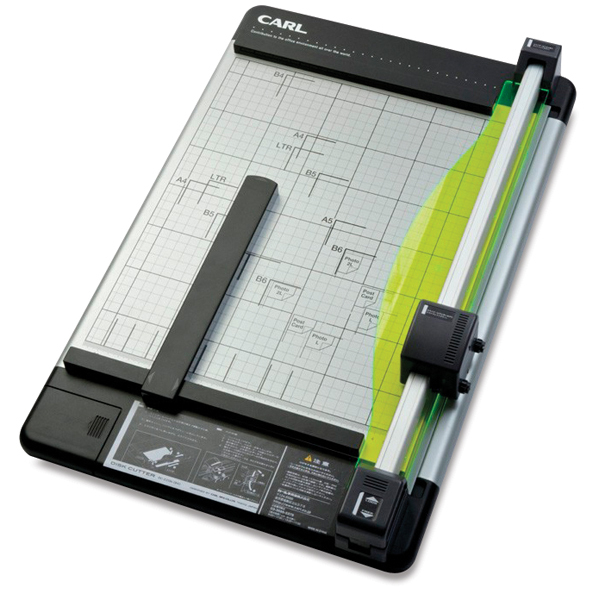 The Carl Green Machine Heavy-Duty Rotary Trimmer is tough enough to cut through up to 36 sheets of standard 20 lb paper, yet easy on the environment because it's made from 45% recycled materials. Beyond paper, the Green Machine makes short work of cardstock, plastic sheeting, photographs, mat board, and foamboard up to 1/8” thick. Carl's patented locking rail mechanism holds materials firmly in place, while the exclusive Luminous Paper Holder (made from a light-harvesting acrylic material) makes cutting easier and more accurate. Trimming is done on a sturdy, calibrated metal base that features an alignment grid, ruler, and preset measurements for common paper and photo sizes. The base also has a built-in storage compartment for mats and blades (a spare cutting mat and extra blades are included). The Carl Green Machine Heavy-Duty Rotary Trimmer comes with a limited lifetime warranty (excluding blades and cutting mats).